The application of 2 x 2 matrices is a simple process to facilitate thinking and decision-making within both your business and personal life. This book provides five simple frameworks that can be used in many situations to help in organizing events, facts, data, values, tangibles and intangibles in such a way that clarifies, segments, simplifies and makes sense. 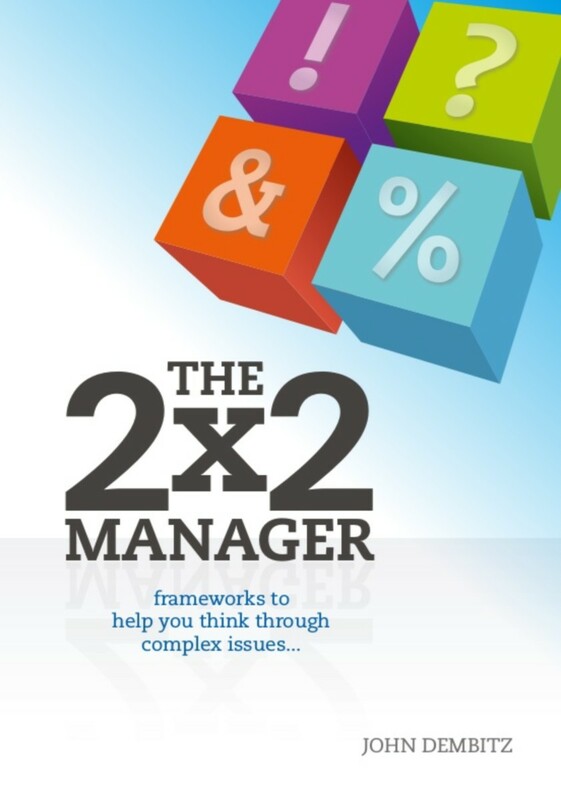 The book also delves into how 2 x 2s are applicable in a number of different ways and concentrates on the four situations where they are most frequently used – Progression, Decision Support, Situation Analysis and Classification. The Johari Window – This 2 x 2 can help describe the process of human interaction. The matrix can help to improve collaboration, collegiality mutual trust and understanding, and hence almost certainly productivity and profitability. Product/Market Matrix – A model that’s been around for almost 50 years and is still as valid today as it ever was. This 2 x 2 can help you make informed decisions on how best to develop the business, such as which products to support, and which markets to seek to expand in. SWOT Analysis – This all-purpose 2 x 2 can be used for marketing and competition, R&D and manufacturing or people and capital, whatever needs a situational review. Boston Consulting Group’s Growth-Share Matrix – This 2 x 2 can help highlight the important relationship between market growth and market share as it relates to the various units within an organization. The Prisoner’s Dilemma – This complex statistical analysis can aid in identifying the values, uncertainties and other issues relevant in a given decision making situation and achieving the optimal result. In-depth descriptions about how you can devise your own 2 x 2 matrices to bring clarity to your challenges are also included. John Dembitz has had an eclectic career spanning some 40 years, including being a McKinsey consultant, CEO of professional service organizations, executive director of a merchant bank, a manufacturing company, and chairman and non-executive director of a diverse range of SME companies quoted, private and PE backed. He has an MBA from London Business School, and a BSc (Hons) from Manchester University.